During the month of October, you can’t go too far without spotting pink ribbons or advertisements asking you to join the fight. Breast Cancer Awareness speaks a universal language. According to the American Cancer Society, about one in eight U.S. women will develop invasive breast cancer. By the end of 2015, there are expected to be nearly 232,000 new cases. The good news is there are more than 2.8 million breast cancer survivors in the United States. Two of those survivors are a part of our CPS Energy family. Laura Viera, a customer service representative, and Melody Kreutziger, a senior claims representative, shared details of their journey—the daily battles, their scars, and how they overcame the most challenging ordeal of their lives. While early detection through a mammogram offers substantial benefits, you don’t always need a machine to tell you when something is wrong. “Chemo” works by attacking cells that are dividing quickly, which is why they work against cancer cells. But other cells in the body, like those in hair follicles, also divide quickly. That’s why hair loss is a common side effect. Melody started her six rounds of treatment every three weeks in hopes to shrink the tumor. She then scheduled a lumpectomy, which is a partial removal of the breast. Battling cancer can leave a scar and for both Melody and Laura, the decision to lose a part of themselves was an extraordinarily difficult one to make. With the support of her husband, Laura found comfort in knowing she was making the right decision to have a unilateral mastectomy. 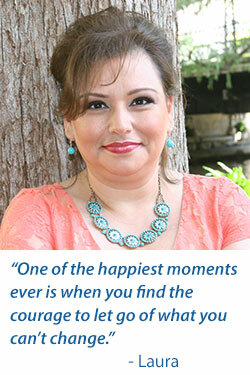 For Melody, the lumpectomy soon turned into a decision to remove both breasts. Through the process she learned that a relative had passed away from breast cancer, so she opted to have a genetic test performed before making the decision. A breast cancer susceptibility test (BRCA) is typically done for people with a strong family history of breast cancer or ovarian cancer, and for those who already have one of these diseases. It can detect if you carry the gene mutation which causes cancer. Because the BRCA gene is hereditary, Melody and her husband decided to have her 22-year-old son and 19-year-old daughter tested for the gene mutation in 2013. Melody and Laura are now cancer free! They’re living proof that what doesn’t kill you, only makes you stronger. Melody is now eight years cancer free. 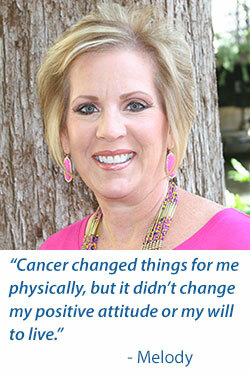 “Cancer changed things for me physically, but it didn’t change my positive attitude or my will to live,” she says. Both women are advocates for seeing a doctor and having regular mammograms, whether you are a male or female. Annual mammograms are typically covered at 100 percent by most health benefit plans, including ours. The ACS recommends women over the age of 40 have a mammogram once a year to help detect any early stages of cancer. Mark your calendar today! Join the fight against breast cancer by starting or joining a team at next year’s Race for the Cure in San Antonio on April 9.